APPLICATIONS WILL BE AVAILABLE ON SUBMISSION DAYS, OUTSIDE OF ROOM 217, OR .RIGHT HERE. FOLLOW THE LINK TO A DOWNLOADABLE WORD DOCUMENT. The title “Vox Populi” means “Voice of the People.” Vox Populi is the annual undergraduate juried exhibition, which takes place at the Helen E. Copeland Gallery, located on the second floor of the School of Art Haynes Hall on the Montana State University Bozeman campus. The juried competition is open to all undergraduate students currently enrolled at Montana State University Bozeman, to showcase the diverse range of art methods, techniques and skills of the MSU student body. In addition, the jurying process is meant to encourage and inform students about professional practices. When is Vox Populi taking place? The exhibition dates are Monday, January 23rd – Thursday February 2nd, 2017. There will be a public reception on Thursday, February 2nd, 6:30pm – 8:30pm. Any current undergraduate student enrolled at Montana State University in Bozeman. Any medium of artwork is acceptable. The artwork must be finished and ready for installation. If your artwork requires specialized equipment (i.e. headphones, screen, special installation hardware, etc.) you must provide the equipment along with your submission. Please do not submit any work that is not ready for install; for example, charcoals drawing that are not fixed, wet paintings, or works that are being exhibited elsewhere. All paintings must have a proper hanging device (ie, wire, French clip, etc.) Sticking a work of art on a nail is not acceptable and is unprofessional. Unless you have prior authorization from the Gallery Director, lack of a proper hanging device will disqualify the piece from jurying. Although framed artworks are preferred, unframed work will be accepted only at your own risk: unframed work is prone to damage and the gallery will not accept responsibility for any damage to unframed art. Unless otherwise requested, works will be hung with t-pins or magnets. Absolutely! Audio and video pieces are always welcome. To submit A/V pieces, please complete and submit an entry form during the submission dates. After submitting your entry form, email your file or link to ella.watson@montana.edu. Label the subject line of the email with “VoxPop2017 [Your Name]” and include the title of the artwork in the email so the jurors have it for reference. What if I want to submit a large-sized installation or sculpture? Large scale works or installations will be accepted for submission, but keep health and safety in mind. All artists should take into consideration that their work must be safe in a public space. If your sculpture is unstable, toxic, or dangerous to the public, it will not be accepted. If your artwork includes audio/video or is too large to move, you may submit documentation media (photograph, video, or audio file). To submit digital documentation, complete and submit an entry form during the submission dates. After submitting your entry form – email your media or link to ella.watson@montana.edu. Please label the subject line of the email with “VoxPop2017 [Your Name]” and please include the title of the artwork in the email so the jurors have it for reference. Proposals for installation pieces, social happenings, performance, etc. should come with a description and or plan in the email. The more information the better, but keep it short and concise. Sketch out the installation, give a small video of the performance, etc so the jurors can get a clear idea of your piece. After submitting your entry form – email your media or link to ella.watson@montana.edu. Please label the subject line of the email with “VoxPop2017 [Your Name]” and please include the title of the artwork in the email so the jurors have it for reference. Given that online submissions can be problematic, it is requested that you submit a copy of the work on a CD or DVD. It s also suggested that you submit your work earlier in the submission dates, that way if there are issues, we have three days to resove the problem before jurying on Friday, January 20th. Where and when may I submit my artwork/s? 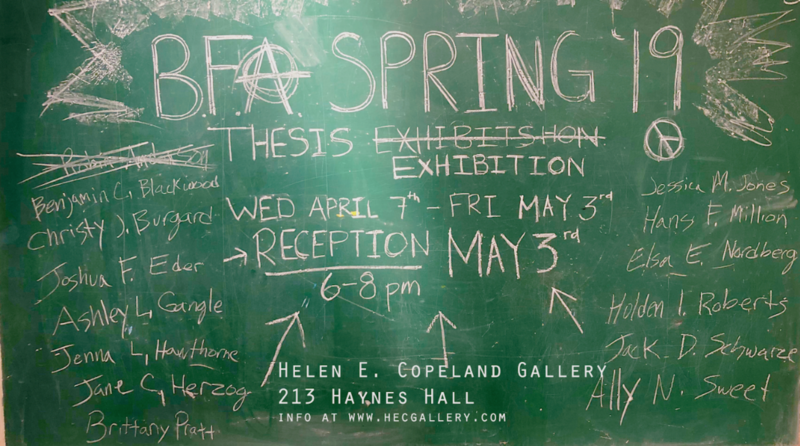 Turn in submissions in the Helen E. Copeland Gallery on the second floor of Haynes Hall. January 18, and 19th, 9 am – 5 pm in the HECG. May I schedule an alternate time to submit artwork? No. Submissions will only be accepted on the dates and times listed above. How many pieces may I submit and how much does it cost? You may submit as many, or as few, pieces as you like. The submission fee is $8.00 per three pieces. Each additional piece is $3.00. May I pay with credit card or checks? No. Only cash will be accepted. Please bring exact change if you can. Who will be this year’s jurors? Dean Royce Smith, Dean of the College of Arts and Architecture. How will I know if my work is accepted into the exhibition? You will be notified by email if your work is accepted by midnight on Friday, January, 20th, 2017. If you do not receive an email, then your work was not accepted and you must collect your artwork by Monday, January 23rd by 5pm. We will be installing over the weekend, so work should be available for pick up Saturday and Sunday. Times will be specified at a later date. Please note that due to the lack of storage space, artworks must be collected at the above mentioned times. The gallery is not responsible for lost or damaged art. There will be a drawing for raffle prizes for entries; you will receive one raffle ticket per completed entry form. Your work does not need to be accepted into the exhibition to win a raffle prize. The winning tickets will be drawn at the opening reception on Thursday, February 2nd at 7:30 pm. Please note that you must be present at the reception to collect your prize. I was accepted into the exhibition. When can I collect my work after the exhibition? The exhibition dates are Monday, January 23rd – Thursday, February 2nd, 2017. You may collect your work on Friday, February 3rd from 9am – 5pm. Please note that due to the lack of storage space, work must be collected at the above mentioned times. The gallery is not responsible for lost or damaged art. I was not accepted into the exhibition. When can I collect my work? You will be notified by email if your work is accepted by midnight on Friday, January 20th. If you do not receive an email, then your work was not accepted into the exhibition; you must collect your work by 5pm on Monday, January 23rd. Please note that due to the lack of storage space, work must be collected at the above mentioned times. The gallery is not responsible for lost or damaged art. Where can I find the most current information regarding Vox Populi? Keep posted for updates and prizes for the raffle! We are adding more daily!